The U.S. Coast Guard licensed me as master of sail and power-driven vessels Feb. 28, 1997 after I passed five examinations over a two-day period. The license has been a lifelong dream and is part of many recent changes in my life during the past year. Although I've been sailing for 30 years, I spent the last few months studying the physics of what makes boats float and memorizing the rules of the road. I relearned how to determine the height of tide at any specific time, discovered how to calculate the mechanical advantage of blocks and tackle, and became intimately acquainted with the Code of Federal Regulations, chapters 33 and 42. The five tests included navigation exercises using a chart of the Chesapeake (very familiar to me! ); general navigation problems; deck safety such as knowing First Aid and the difference between a Class A and a Class C fire; rules of the road; and sailing principles. A score of 90 is required on the rules of the road portion; a 70 is needed to pass the other tests. I aced the rules of the road and later took an oath to rapidly ring the bell for five seconds every one minute while at anchor in restricted visibility. (Who could sleep in the fog with that racket anyway?) I now know more than you would ever care to know about weather forecasting, pollution regulations, maneuvering a twin-screw vessel and the special identity lights for mine sweepers. My license allows me to operate any uninspected vessel with up to six passengers (a "six-pack" license) as well as any inspected vessels, up to 50 tons. I want to thank you all for your support and encouragement. Special thanks to my brother, Johnny, (now harbor master of the Medford, Mass., Boat Club); the late Abel Renault, my maternal grandfather, both of whom hooked me on boats at an early age; and to my great-grandfather father, Capt. Alfred Renault, who I never knew, but whose fondness for sail boats I obviously inherited. American Youth Hostels' Sailing Committee in Philadelphia; Jack Bazhaw; Jeff Brown; Capt. Ann Marie Calabria, aka Morgenstern; Capt. Marion aboard Sirius; Capt. 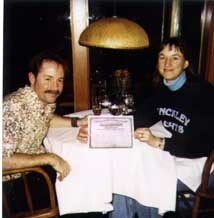 Eric Carlson; Bob Carter, who loaned me his parallel rules when I couldn't find mine in the garage; John and Marianne Castle; my crewmates on "Marianne," Maddie and Denny; the crew of the Tall Ship Gazela; and Chuck Dingée, my first mate, who celebrated my achievement by buying me dinner at the Oyster Bar on Chuckanut Drive. And: Dr. David Harvey; Dr. Ruth Harvey, who tried to convince me, without success, that it is not natural to feel safe at a 30-degree heel; Tip Johnson of Fairhaven Boat Works; "Capt." Bob Kellogg, who let me drive "Marianne" a lot of miles, including through the continental divide in Panama; Dan Krachuk; Bill Land, who gave me a crash course in celestial navigation; Jim Martin; Steve McGowan; Capt. Jay Mullen; the Pacific Marine Exchange in Bellingham; Robin, Gilbert, Alexis, Josh and Reese Palley; the Philadelphia Maritime Museum, now Independence Seaport Museum. Plus: Rod and Annie Sadler, who run Pyne Point Marina in Camden, N.J.; Leslie Scism; Steve Shelly, who had so much confidence in my abilities, he bought me a captain's sweat shirt in 1989; the vicarious Ramona Smith; the future Capt. Chris Spens; the Traditional Small Craft Association; the late Peter Vanadia who told me I could do it; and the documents section at Western Washington University's library. To read more about my sailing adventures, or if you want to contribute to my new boat fund, check out my sailing resumé. To find the answer to the question, "Can Dead Men Vote Twice?" see your local Coast Guard Auxiliary or Power Squadron.